When you fly anywhere in the Caribbean, you have to ponder, at least for a brief moment, that there may be beaches where people don’t wear the entire bathing suit, ha! That happens more than the typical American would like to think because culture is very different outside the borders of the USA. And so it is here in Saint Maarten. Up along the French side of the island is a beach called Orient. It’s not all skin, but a large part of it is optional, so know before you go. You don’t have to partake, but know when you go that if the sun is out you’re likely to see more than you’re used to. Truth be told, this is one of the finer beaches along the island, not only because it is wide and the sand is oh, so white powdery, but because the direction it faces the sea, there is alway nice water to enter and cool down, or to jump in and explore. And it takes a bit of finding so don’t expect too big a crowd except when the occasional cruise ship comes in and people have a long layover which allows them to be transported to Orient Beach for a gander. If skin and sand are all you want to see, you can do that and head back to your hotel in one afternoon. However, choose to eat and you have a myriad of delicious foods right in the neighborhood. French cuisine abounds around Orient Beach with marketplaces and small shops making this part of the island a gem to visit, even if you don’t make it to the beach, or don’t want to go out there. It’s not for everyone. You can stay on this side of the island as well. There are plenty of rooms and some nice hotel chains which will keep you exploring the French side. 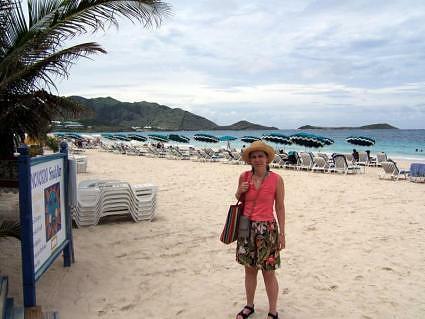 We rented a car, but stayed on the Dutch side of Saint Maarten. There is traffic and it took us a good half hour on the day we went exploring, but it was well worth the slow trek across this interesting place. Don’t think you have to spend an arm and a leg to stay here. Stop by one of our favorite websites and see what is available. Well, actually, there are two. The first is www.VBO.com and the second is www.AIRbnb.com. The first is Vacation By Owner and you’ll find deals at Orient Bay, Cupecoy, Simpson Bay, French Cul de Sac, Dawn Beach, and Grand Case Beach. The second, AIR Bed and Breakfast, are actual people who own homes and apartments on the island and are renting out a room or the whole place. Check them out.